After decades on the nutritional blacklist, lard may be ready to make a comeback. The same product that the AHA, AMA and USDA blackballed for fear of an epidemic of elevated cholesterol and heart disease. The same product that we replaced with hydrogenated vegetable fats. The same product that has become synonymous with obesity. So, how come lard is on the comeback trail? Because the scientific case against lard is beginning to fall apart…just like a nice flaky pie crust made with 100% leaf lard. 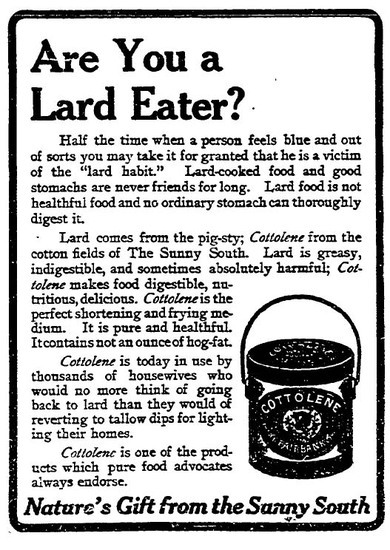 Way back in the day, lard was the fat of choice in North American households. It was cheap, plentiful, great for frying and without peer when it came to shortening a tender pastry crust. 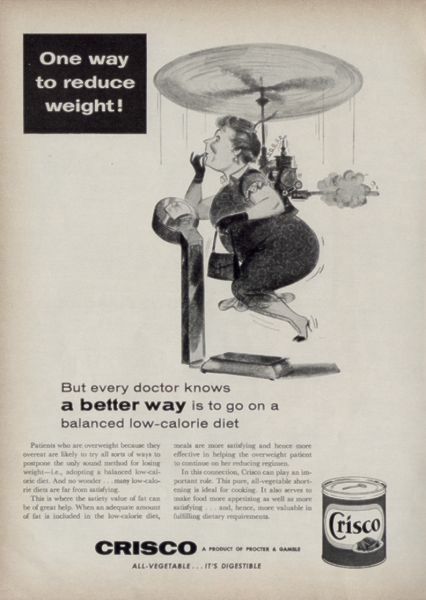 However, shortly after WW2, American research into nutrition came to the conclusion that saturated fats were the cause of increased cholesterol and heart disease. And since lard and other animal fats are higher in saturated fats than vegetable oils, they became the ugly nutritional stepchild and fell out of favor. And in it’s place, stepped Crisco and various other hydrogenated vegetable oil products. And we all know how well those hydrogenated oils worked out. Hydrogenation, the process of adding hydrogen atoms to unsaturated oil, makes vegetable shortening shelf stable and solid at room temperature, but it also turns good fats into that evil man made creation…trans fats. Although hydrogenated vege­table shortening doesn’t look like a saturated fat under a microscope, it acts like one, raising bad LDL cholesterol levels in the blood. Even worse, it can also lower your levels of HDL cholesterol. With this new tidbit of knowledge, food manufacturers around the globe have been desperately searching for a replacement for their hydrogenated vegetable oils. Most of the large food producers have reverted back to industrial grade palm oils. Many smaller producers and most professional chefs went another route. They went back to animal fats. Initially, they went back to butter. But not just any butter. Fancy schmancy, organic artisnal butters. Butter like your great grandma used to churn by hand. 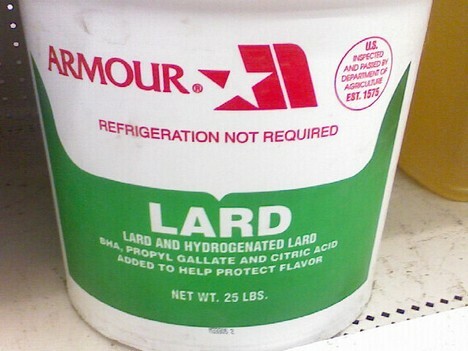 And after the use of butter became mainstream, a few brave souls began to experiment with lard. But of course, they didn’t tell their customers. 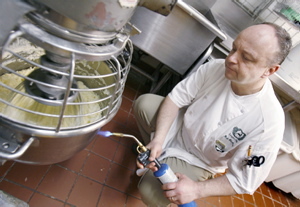 Most chefs simply neglected to mention that their dishes contained lard. It should also be noted that, like the artisnal butters used in the best kitchens, the chefs and bakers using lard in their recipes do NOT use the bricks of highly processed lard that you might find in your grocery store. They are either producing their own lard or are buying their supplies from small producers or organic butchers eager to service this niche market. Okay, enough with the gastronomical history lesson, what about the science? As I mentioned previously, way back in the day, the medical powers that be told us to stop cooking with saturated fats and replace them with vegetable fats high in polyunsaturates. Lard Habit?? ?…The next thing you know, Maury Povich is going to be doing a 2 week special on unwed mothers addicted to lard. Obviously the advertising campaigns were successful. Are animal fats the killer ingredient that Ancel Keys et al said they were? What about canola oil and coconut oil and…? Next postThe End of MAN? Wow, he lived to be 101! In defense of health, does it really matter which the lesser of two evils here is? I guess if one has to make a pie crust or other baked good, then I’m sure one is better than the other. Perhaps one raises blood cholesterol levels more than the other? I suppose it’s more realistic to discuss the lesser of two evils than to suggest that neither need be consumed. I think there’s a tendency for people to swing the opposite direction when they learn a lot of what they had been taught is wrong. What I mean is that when people start to learn that animal fats have been falsely demonized, they often jump right onto the “eat as much saturated fat as you want” bandwagon. I believe based on Cordain’s research looked at the total fat percentage, and % saturated fat in game then the estimate of the percentage of total calories this represented for early man. Based on these figures he came up with a recommendation of 10-15% of calories from saturated fat. This isn’t really much. So while I’ll agree that perhaps saturday fat isn’t bad, it’s easy to get WAY too much, and I do think most people in modern society would benefit from reducing their intake. I am increasingly suspicious of the hypothesis that saturated fats cause atherosclerotic complications such as heart attack, stroke, and death. But I don’t seem able to find the time to go back over ALL the research that might support or refute the hypothesis, and form my own opinion. I’d love to see some world-renowned nutrition/medical figurehead(s) do it for me. That would save me about 40 hours. It’s up to you now, DR.
As usual great post!!! Cant wait for part II. Also i do tend to agree with Chris also. Great post. I’m curious–what’s your stance on Palm Oil? I’ve used a product called Spectrum Shortening for baking as well as for tamales which is 100% Organic Palm oil. Though trans-fat free it’s high in saturated fat. What do you think of it? Chris – There is some disagreement amongst anthropologist when it comes to the diet of our hunter-gatherer ancestors. On the other hand, our ancestors also ate the organs, brain and marrow of the animal – much higher in saturated fat. As I see it, our meat is of lower quality (fatty acid profile, steroids, antibiotics, etc…) than our ancestors. And since those poor qualities manifest themselves mainly in the fatty tissues, Dr. Cordain may be 100% correct. I would love to see more objective research done to confirm this hypothesis. However, main stream medicine has been anti-fat for the past 50-60 years. As a result, nutritional research has not kept an open mind when it comes to research the effect that fat / carbs has upon our bodies. Hopefully, attitudes are changing and we may soon get some objective questions and answers. I agree with your point that we shouldn’t swing too far the other way and start recommending a big bowl of lard-Os for breakfast. However, I think in some circles this is already happening. Some of the Paleo-Diet crowd are quite fanatical in their beliefs. When it comes to the fatty acid profile, the assumption is that animal fats are all saturated while vegetable fats are a mix of poly and mono fats. Hopefully, we see more objective research in the near future and we will be able to make a more educated decision. I think, at this point, all of the “experts” are at the hypothesis stage. More research is done and everything we have been taught is turned upside down. Decades ago, I don’t think heart disease was as prominent as it is today. Is it because we switched to vegatable oils? Natural fat from properly raised animal sources should be better for you no? Hi, thanks for the interesting article! I have an exercise physiology background and I keep a few pigs as a hobby. I find that the quality of fat varies greatly between our animals and commercially reared pigs. Ours are fed a diet rich in fruit, veggies, roots, grass (as well as barley), whereas commercial pork is fed a grain-based diet (with some added soya). 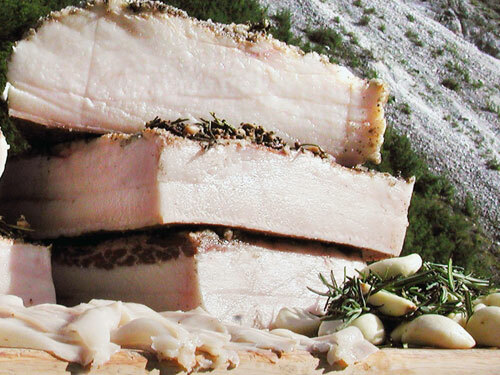 In short, the fat from our pigs is noticeably softer, with a lower melting point. I haven’t carried out lab analysis, but the fat from our pigs is much more “buttery” than commercial pork – it actually melts in your hand while you are butchering. I find the same with our home made lard, which is actually softer than butter. Whatever about the argument about saturated vs unsaturated fats, I am reasonably certain that our pork/lard has a higher proportion of unsaturated fat as compared with the commercial product (due to the different melting points). The research supports this notion, especially with regard to monogastric animals like pigs – the diet of the animal matters, and the end result (meat) is not as uniform as we might think. Basically I strongly agree with your point below re: fat profile and organic meat – just thought I’d throw in some first hand experience!